This time on Mas’ Zelda Collection we look at one of my most prized Zelda possessions. 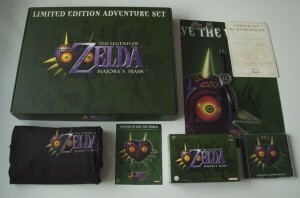 The Majora’s Mask Limited Edition Adventure Set. Released back when the game originally came out for the Nintendo 64, there were only 1,000 of these made. Nowadays they are extremely hard to find and sell for over $3,000 when they do pop up on auction websites. Check out the full video after the jump.